Steel Frame Pyramid screen shares the same property as the steel frame flat screen. And moreover, It can increase the screen area up to 150% without changing the construction of shakers. Different layers with different density. To arrange these layers reasonably and exactly, the screening effect will become more and better. The wedge-shaped fastening device, can make the erection of screens more handily and quickly. The Steel Frame Pyramid screen mesh is designed with wavy shape. It is bonded with the metal lining closely with the installation mode of steel frame or hook strip wedge clamping device. Compared to the flat type mesh with same specification, the pyramid mesh has much larger effective area by 25% to 50%. Thus, the amount of drilling fluid that can be processed is increased largely. For the mesh numbers of the screen meshes are different, rational and correct combination of screen meshes can get finer screening effect. 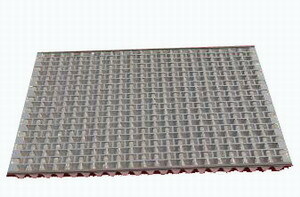 In addition, we can produce the pyramid shale shaker screen with different specifications and dimensions to meet the needs of customers. Steel Frame Pyramid Screen are mostly applied to the shale shakers with wedge fastening equipment. The screen frames adopt that high-strength square steel tube welded to multi-ribbed construction. They are sturdy and reliable. These screens are constructed with two or three stainless steel layers bonded to a steel support plank. Accessory rubber plugs may be used to repair rips or tears. By doing this, we can cut down time and reduce the production costs. We can supply steel frame screens with mesh sizes ranging from 20 to 250.